This is the roach that has taken up residence in our mailbox. Almost everyday for the last three weeks he has greeted me as I've gotten the mail. He snacks on the mail and then appears as you go to get it out of the box. Today he was between the electric bill and a magazine and he fell out as I pulled the mail. I've been waiting for him to fall in my lap. A few days ago my mom suggested I get some bug spray and put it in all the cracks because that's where he is when there is no mail in the box. I was thinking of doing just this today when I came face to face with him. He stared me down for some time, which is unusual. He usually slips down in a crack right away. I guess I was tired of being scared to get the mail. I took a deep breath, grabbed the magazine, covered it, and pushed as hard as I could. I was worried he would still be alive, but when I turned the magazine over he was very dead. 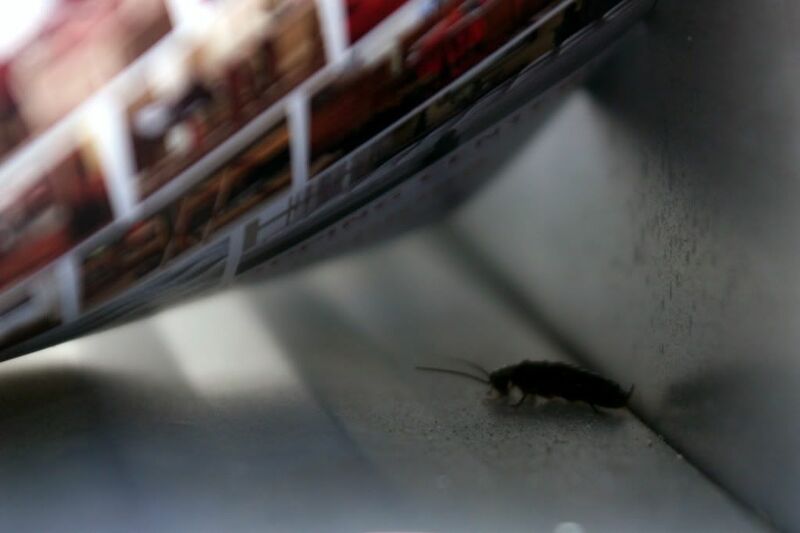 So, today this roach met a dreadful fate all because he decided to live in my mailbox. So long roach. Now I only hope that he didn't have relatives living with him. The picture was a little tricky. I was holding up the mail with one hand and the heavy camera in another; hence the mail being extremely out of focus. I hate cocroaches....He is lucky he lived so long. I didn't know that we had cockroaches in Iowa? I am glad that you were able to kill him, and I hope that none of his family comes for revenge. sick! you are so brave I would have opted for the bug spray! !